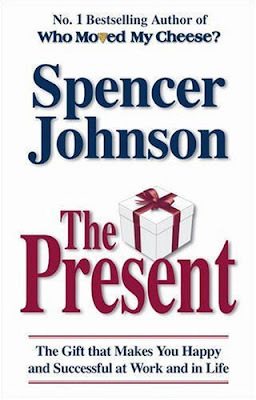 The book of the week was The Present by Spencer Johnson. This is another quick read written by Johnson... Fictitious stories conveying a great idea. This one is about maintaining a good mental focus on life and using it to stay happy. Be Present- Focus on what is right now. Use your purpose to respond to what is important now. Learn from the Past- Look at what happened in the past. Learn something valuable from it. Do things differently in the Present. Plan for the Future- See what a wonderful future would look like. Make plans to help it happen. Put you plan into action in the Present. All these things seem so simple, but sometimes the simplest idea is the one that we overlook. I have been thinking a lot about this subject lately. I had a big old master plan based on my current living situation and now my living situation is changing. I would say the most disappointing thing is that I felt like I was unable to make long-term plans. Then this week I was hit with some wisdom from a friend when talking about this very subject. He said "Plan to depend." I have been thinking a lot about it... I am a religious man and I have been thinking about that phrase. I now have a newer outlook on planning.. I will now make plans to depend on God. I will still make plans, but I will make plans with more adaptability depending on where he needs me. So how does this change the way I make my plans? In the future I will be making my plans with sub-plans. For instance, if I am living in Colorado and I make a few commercial real estate purchases I will make plans to cover me if I have to move to New York. This can be done by lining up property management companies if you are self-managing or having potential buyers in place in case you want to do a complete liquidation. This whole concept really makes the tie between both of Johnson's books; Who Moved My Cheese and The Present. Understand change will happen and then adapt to it... while at the same time living in the Present and learning from past experiences to do better in the future. There is a lot of places I can go with this subject, but the most important thing to realize is to focus on today, this will keep you happy and less stressed. Today is the only thing you can control... You can't control the mistakes you've made in the past and you can't completely control where you'll be 5 years from now. Just do your best at everything you do today, in the Present. Now, I don't want to discourage anyone from planning because it might not happen precisely how you envision it... it's still very important to plan, but instead of having your plan be the end-all-be-all... "plan to depend." This book is a quick and easy read, and I think it's worth while picking up. As always, if you have any questions on the book don't hesitate to ask. I would be more than happy to help anyone that wants it.